To Prepare the Steaks: Lightly salt the strip steaks.Using the heel of your hand, firmly press the cracked peppercorns into both sides of each steak. Heat the butter and oil in a heavy skillet. 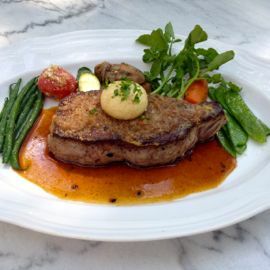 When the butter begins to brown, add the steaks and cook over moderately high heat until they are browned on both sides. Allow 3 minutes per side for medium rare. Remove steaks and place on a platter, keeping them warm while you prepare the sauce. To prepare the Sauce: Pour 1/2 of the butter and oil mixture out of the skillet in which the steaks were prepared. Then add in the shallots, peppercorns, and wine, and place over high heat. Let mixture reduce until it is almost dry. Add the beef stock and bring to a boil. Remove from the heat and stir in the butter with a whisk. Add the garlic and lemon juice. Taste and adjust seasonings. To Serve: Brush each seared steak with 1 - 2 tablespoons mustard to taste. Melt the butter in a small saucepan over high heat until the butter begins to brown. Remove pan from heat. Add the minced shallots and stir into the browned butter. Immediately spoon mixture over the steaks. Place steaks on 2 warm serving plates, pour sauce around each and serve.